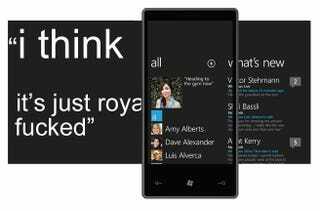 Windows Phone 7 could save Microsoft's mobile future, but what do developers think about it? IM app BeeJive's CEO Kai Yu: "I think it's just royally fucked. That place is so big: The tools, the people, it's all so fragmented." The one developer Wired talked to who was actually kinda up on Windows Phone 7 was the COO of Pageonce, which makes the awesome app Personal Assistant for iPhone and BlackBerry—he's excited that Microsoft "has some incredible platforms they can tie all together with the new mobile platform." But then there's Peter Hoddie, the CEO of Kinoma, which makes media software for Windows Mobile, who wasn't too thrilled about Silverlight supposedly being a huge component of the app development kit: "Silverlight, geez...Just when you thought it was safe to go back into the water." Update: Corrected a mix-up with the quotes from Pageonce and Kinoma's respective execs.